For years, we have hung an Ansel Adams calendar on our master bath wall, next to the mirror. As I curl my hair, I often look at and think about the picture for that month. 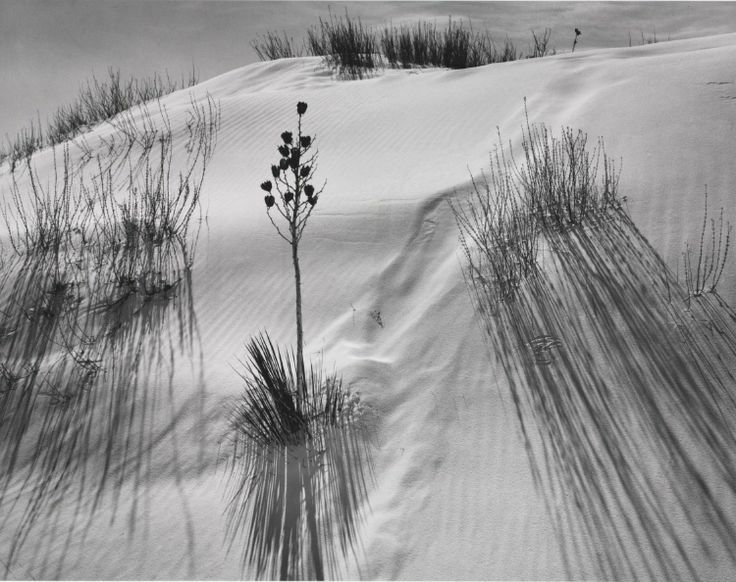 This month, this picture called "Dune," taken in New Mexico's White Sands National Monument, came up. I keep looking at it and wondering, why do I think this is beautiful? It's just plants in sand and their shadows. Yet, I do. I think it's beautiful. I looked at one of my favorite podcasts, "On Being," and the episode this week is called "The Landscape of Beauty." Now I read a blog entry in "Brain Pickings" and it has a link to that same episode. When this kind of thing happens, where I see connections to the same concept or thing over and over, I think of several things. First, I think of Carl Jung's collective unconscious, where we share an unconscious mind. And I think of the string theory of everything, "a single explanatory framework capable of encompassing all forces and all matter," where different events resonate, like a note of music or a vibrating string, and affect other events. And over all of that, I think maybe this is God talking to me. Like Samuel, I stop and say, "Here am I, Lord," and try to figure out what God is calling to me. Many times it seems easy. I think often of a person and I feel I need to connect with that person, and pray for them. In this case, it doesn't seem easy. What could God be saying to me when I see references to beauty over and over again?